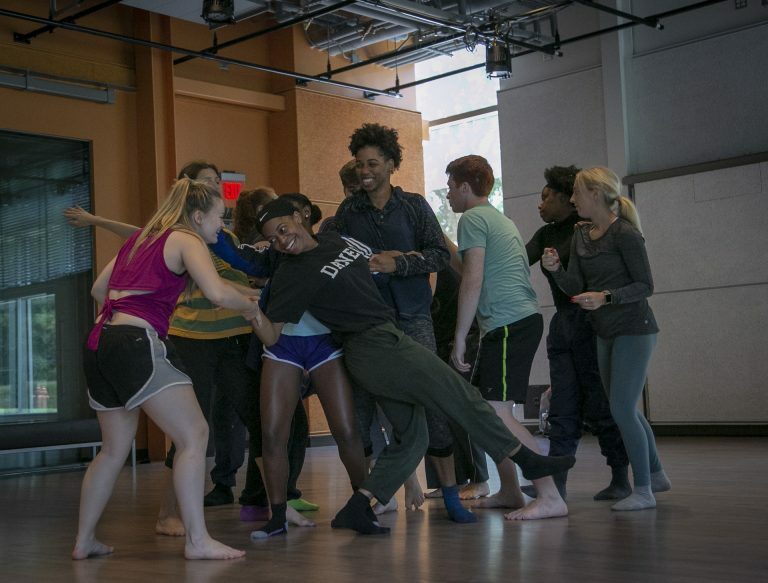 Duke's new arts center is "a beautiful, beautiful building" that gives her students the facilities and central gathering place they've long needed, says ADF dean Leah Cox. 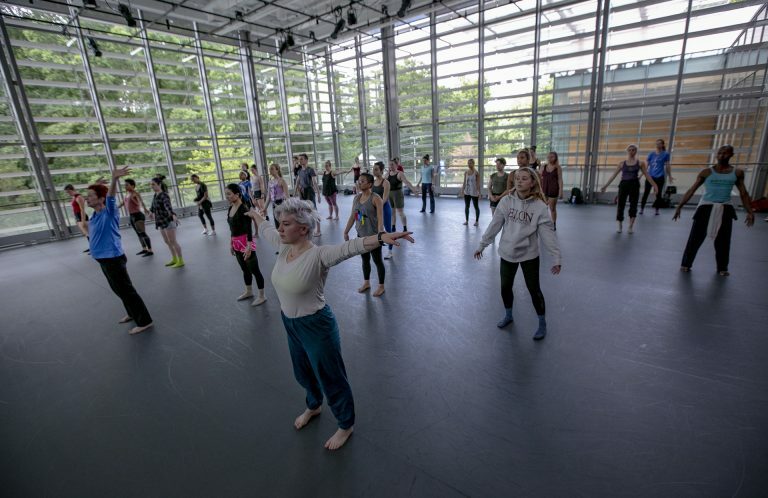 One of the most delightful and distinctive signs of summer in Durham is the appearance on and around Duke’s East Campus of a flock of young adults with a certain unmistakeable posture and grace—the 300-plus students in the American Dance Festival’s Summer Dance Intensive. 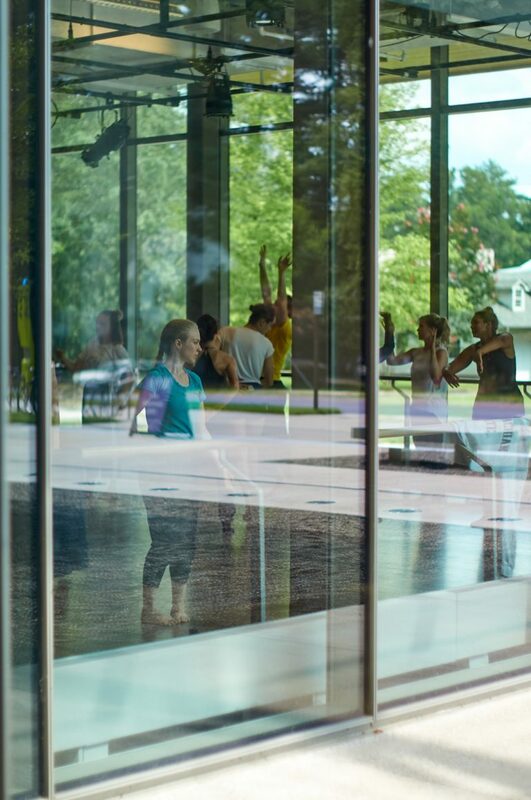 On a routine school day, ADF offers about 30 large dance classes—no small feat at a university with just a few dance studios. The Ark, Duke’s prime space for dance, is beautiful, but can be sweltering without air conditioning. 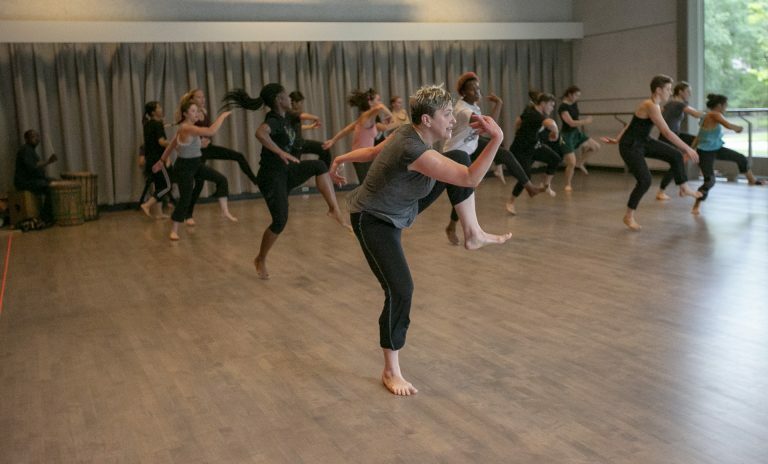 As Duke’s Dance Program has grown, a few other spaces have been adapted for dance—but that left a lot of classes meeting in gyms or lecture halls. This year there was a quantum leap. 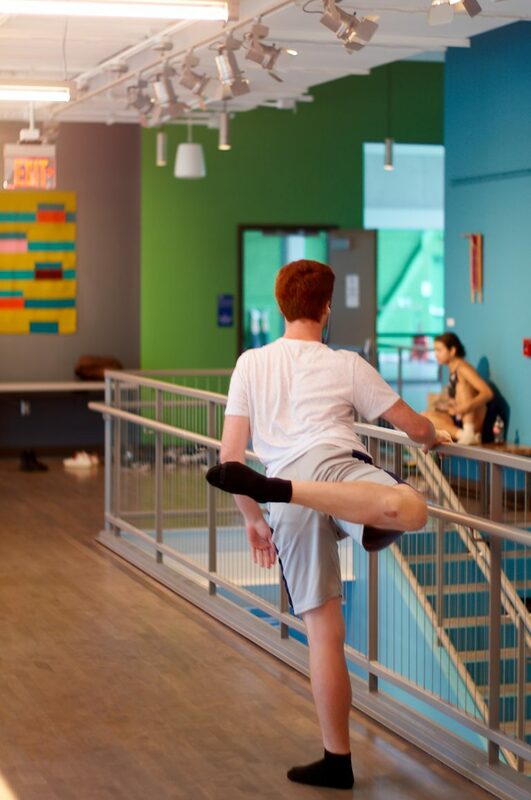 ADF had access to four deluxe studios in the new Rubenstein Arts Center. The festival also presented three productions in the von der Heyden Studio Theater. Abby Zbikowski's class in room 124. Photo by Megan Mendenhall. To find out how this upgrade was playing out, I spoke with Leah Cox, ADF’s dean of faculty. Her connection with the school goes back two decades, and 2018 was her fourth year as dean. She’s thoughtfully cautious about change, as she should be leading an institution that is shepherding a young tradition—modern dance—that it is bound to by birth. She is also deeply tuned in to the subtleties of the dance studio and the performance hall. Robert Zimmerman (RZ): I see from your bio that you first came to ADF as a student. Leah Cox (LC): Yes, I came to the Summer Dance Intensive in 1995, after my freshman year in college. I remember taking West African dance with Sherone Price, who is still here, and dancing out on the lawn near the statue of Mr. Duke. I actually had a very difficult time that summer. It put me in contact with so many ideas about dance and so many people. I never realized how vast the world of dance was and how many people were doing it at a very high level, with a real sense of purpose. When I left, I wasn’t even sure if I wanted to dance anymore. I actually switched my major from dance to philosophy because it’s a discipline that’s about figuring out purposes. That summer ended up being the catalyst for me in understanding that I had to know why I dance in order to keep dancing. It was a very productive information overload, something I don’t think I could have gotten anywhere else. There’s no other place like ADF, and I don’t say that as a shameless plug for our program. It’s just a fact. Rehearsal for Abby Zbikowski Footprints piece in the Ruby Lounge. Photo by Megan Mendenhall. I came back several times as a performer after 2001, when I joined the Bill T. Jones/Arnie Zane Dance Company. It was our favorite place to perform. 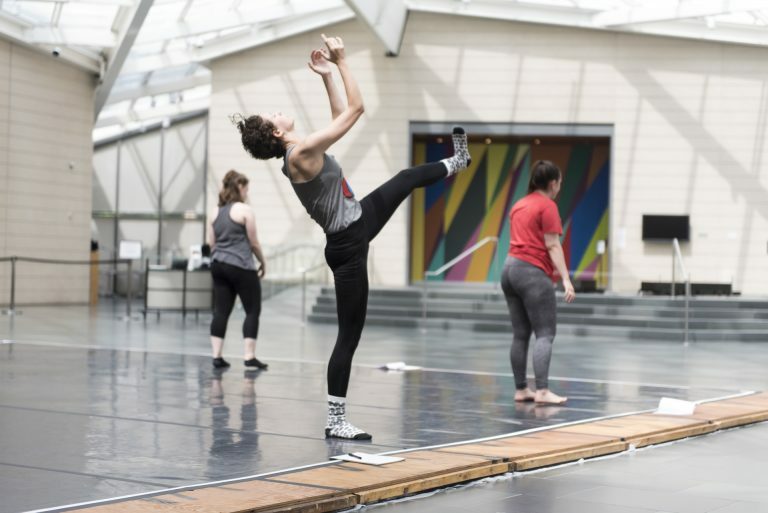 For a professional dancer, going to ADF is kind of like being a gamer at a gaming conference. You get to share what you love to do with a community that loves you. RZ: I’ve lived in Durham since a few years after your student summer here, so I’ve seen the students come and go quite a few times, but I still learned a lot about the inner workings of the school by taking an ADF tour in the Ruby last week. The guide, Joseph Fedrowitz, was director of the summer school when you were here, right? LC: Yes, Joseph was definitely part of the school when I was a student, although he was working behind the scenes and wasn’t part of my experience. The history he knows is immense, and he continues to lead our school tours, which gives him a perspective on the present, too. He’s one of ADF’s gems, and one of my most invaluable references. RZ: Hearing him talk about having to scrounge and adapt space wherever it could be found, and just seeing the size of the classes, put the Rubenstein Arts Center in perspective. But moving into a brand new, super-deluxe building has to be a little complicated for an institution with so much history. I can’t help wondering what’s lost. LC: Yes, I won’t lie, I was very skeptical of the new building. I was worried it would change our understanding of what ADF is. And the Ark has great history for us. Limón Technique class with Gerri Houlihan in room 224. Photo by Megan Mendenhall. LC: What’s amazing about the Ark is that it has materials that feel real to us and stimulating. It has a conversation with the windows all around and with nature. We were also afraid the new building was going to take us away from East Campus. But then, when I looked at how we were actually finding spaces there, we were all over the place. We didn’t have a central gathering place, and that makes it hard for students to have a sense of community. What’s so marvelous about the Ruby is that it does what the Ark does–and gives us the center we’ve been wanting. Most of our classes happen there now, and I see students hanging out together during the breaks. They’re getting more of an opportunity to form friendships and relationships. The way the building is structured creates conversations between rooms—you can be in one studio and see what’s going on in others—and it also creates conversations between inside and outside. All of the studios have access to natural light and natural elements. You’re always seeing the trees. And it matters. It matters what your home looks like. It matters that it’s made of materials that are stimulating and pleasing. Most dance programs in this country started out in PE buildings, in renovated gyms with no natural light. Moving into a space like this changes the way you treat yourself, your colleagues, and your work. Ballet class in room 201. Photo by Robert Zimmerman. LC: I know it might sound like I’m exaggerating, but I’m not. This year has been significantly different in terms of the quality and the tone in the studios. That doesn’t miraculously happen from one year to the next when other things stay the same. The meaningful thing that has changed is the new building. I had no idea it could make such a difference, but it does. RZ: The building was designed to have that effect. It’s a partner to the Nasher, with a similar look, but there’s one big difference. The museum is a protected space, set back in its lot and mostly windowless—kind of a fortress for art and art viewing. The Ruby is right on the corner and it’s all windows. It’s meant to make a statement: here we are making art. LC: That’s what I love when I drive by. It’s a very safe way to invite people to stop and look. No one feels exposed either for looking or for being looked at. And if you want to completely wall-off a studio because it needs to be a private rehearsal, there are shades and sliding doors. That’s part of the genius of the building. I also love how each studio has its own character—it feels organic, with different configurations of space that invite different ways of working. I’ve been to other places that have great facilities but every studio is exactly the same. Here, we’ve got 201, the bright green space upstairs, which is square. Downstairs, there’s 124, which is long, and 102—the Ruby Lounge—with its couches and afternoon shade, which makes it a nice place to have conversations. And then there’s 224, which I think of as the Ruby’s “Ark.” It’s a jewel of a space, a classic dance studio in every way. It’s like dancing in the most elaborate treehouse. 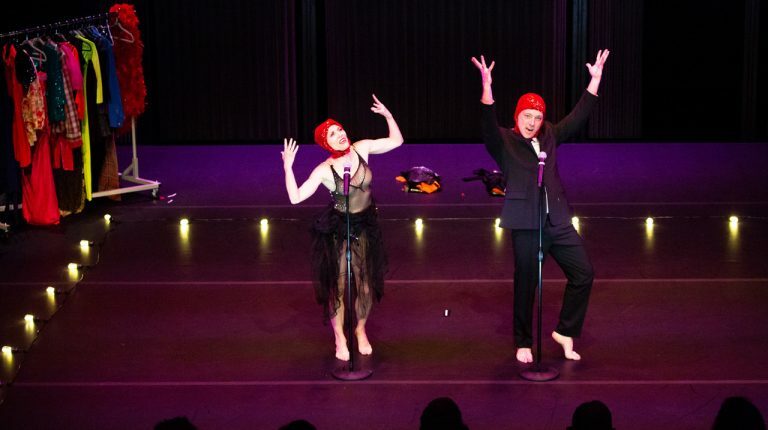 RZ: The other space I want to ask about is the von der Heyden Studio Theater, which is a new performance venue for ADF this year. LC: I’ve enjoyed that space! I’ve seen two shows there and we’ve had one other function in it. It’s a really warm space, with comfortable seats and the right amount of legroom. It has an open lobby, so going to shows is easy. And it’s the right size, with the right ratio of the size of the stage to the size of the audience. It’s intimate, yet not so small that you feel exposed as an audience member. RZ: It sure seemed like the perfect venue for the show I saw there (“Places, Please!”). Nicole Wolcott and Larry Keigwin had fantastic rapport with the audience, which of course is their gift as performers, but the room does nothing to get it the way, makes it feel very natural. LC: It’s a really well thought-out space where people can be generous with one another and with the artist. I’ve been conscious in there of what we call the labor of the audience. You don’t really know you’re doing it, but every time you sit in a show you’re trying to figure out how to respond together and you’re getting all these sideways cues from everyone else. In the shows I saw, I think people felt really comfortable laughing out loud, talking to one another, and then being thoughtful together. RZ: Another thing that’s new for ADF this year is that you’re holding classes in the atrium of the Nasher Museum. How did that come about? Is it fair to say that it only happened because you were already bussing students to the new building across the street? LC: Absolutely. When we were contemplating the move and I mentioned needing as many spaces as possible in or near the Ruby to hold classes. Jodee Nimerichter—ADF’s Director—proposed the Nasher. She has presented performances there for several years now, so we already had a relationship with them. I chose composition and repertory classes for that space hoping that they would be particularly catalyzed by the museum environment. The choice was also my way of honoring Rodger Belman, a dear member of our ADF community who passed away recently. He was always bringing his ADF classes to the Nasher for inspiration. RZ: It was an inspired use of open space. LC: Thank you. I’m so grateful to Jodee and to the folks at the Nasher.